There is nothing quite like cuddling under a silk quilt ... especially one that has personal meaning. 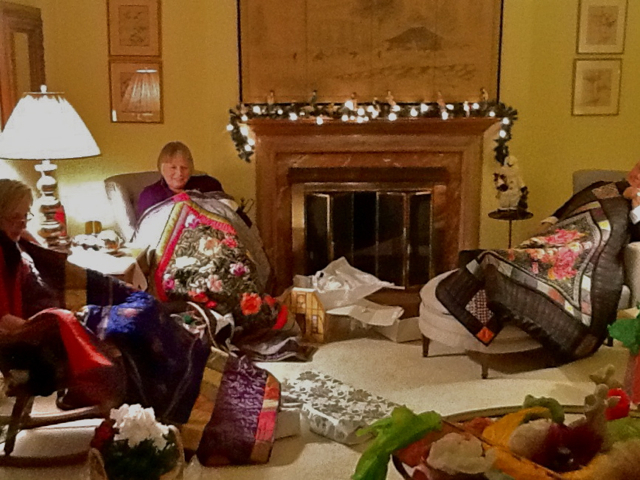 My friend, Alicia, and I created quilts as mutual Christmas presents for three of our friends with silk scarves that had belonged to the mother of two of them and an older friend to all of them. Each of them is about 60"x 60" and batted with wool. Silk yardage, as well as silk-like fabrics are combined with the scarves to complete the designs on the fronts and backs. The exception is the backing of this one made for our friend who has grandchildren. The cotton batik and yardage on the back makes it a bit sturdier for her to cuddle under and read stories with them. Two scarves also make up the front of the one above. The quilt below has one in the center set on point and the corner triangles are made from another cut diagonally into four sections. The green fabric is "silk cotton" by Robert Kaufman. The color selection was limited when we shopped for it. How well it blended in with this and the next pictured quilt surprised us. The print fabric on the back of this one is a rayon blend. A center scarf is set square and another one is cut into corner blocks for the quilt below. They are combined with silk yardage to complete the design. The same purple satin is on all four sides around the outside edge of the back and that's the same green satin cotton in the center diamond. This one had been planned for one of those three friends. That is until the son of one the women whose scarves were used for these quilts saw it. He fell madly in love with it, so this quilt will be his when Alicia finishes burying the quilting thread ends and hand-stitching the binding in place. The top has one scarf on point in the center, two small scarves cut in half to complete the center square, plus another one cut into corner blocks framing black silk panels. On the back there are two cotton prints on the outside edges between the silk corner blocks. The cuddle quilts I make are made as gifts for people I care about, be they family members or personal friends or someone in need of comfort and warmth. Most of my art pieces have price tags, but not these symbols of my love and care for those who receive them. An exception is the man who's getting that last quilt. He absolutely, positively would not accept it as a gift even though Alicia and I wanted him to have it. Our compromise is that he pay for the materials we had purchased to make all four quilts. Now she and I have the pleasure to find a way to splurge on something fun for both of us to do the next time we're together. Oh, yes, I remember your studio overflowing with silk quilts in various stages. Hope Santa brought you lots of sewing goodies and have a very happy New Years celebration! They are lovely and it's a wonderful thing to do with your silk quilts. I have quite a collection and might some day remember this and use some similarly. The touch must be heavenly and the wool batting wonderfully cozy. What beautiful and luxurious gifts to aid healing of any kind. Wishing you a Happy and Healthy New Year Nellie. What fabulous gifts of love! They are beautiful. Beautiful to see and I love the photo of you (cutoff) and Alicia. It was fun to meet her when you were here and I could tell right off she is a lot of fun! I am sure you two will come up with something fun together. Gorgeous! never thought of using scarves . . . Happy New Year! I love how you cuddle up under the cuddle quilts as you make them! Happy New Year, Nellie! Silk!!! These are so wonderful! I was so thrilled to find your blog and ideas for the scarves. A friend just lost her mother-in-law and wants me to make quilts for the four surviving sons for Christmas using the scarves. Besides using starch, did you stabilize the scarves? If yes, what type of stabilizer did you use, to keep it soft?